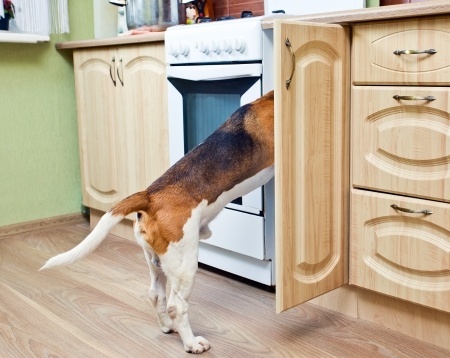 Yes, you can feed the pooch in the kitchen without letting the who place go to the dogs. Your kitchen should be organized to make cooking, baking, storing food, feeding pets, recycling - virtually everything you do here daily - as simple and quick as possible. To make the most out of your kitchen, first consider all the activities your family does there. Then reorganize the space to accommodate those activities. If your kitchen isn't as efficient as you'd like, these kitchen organizing tips can help get things back on track. Cooking can be subdivided into small sub-activities, and these kitchen organizing tips can help. Cooking (as in the actual heating of food): Around the range, put all things needed for cooking. Pots and pans go in the cabinets directly underneath. Hang hot pads nearby. Put a jar of utensils on top of the range, but include only those utensils you use at least once a week. Slicing and dicing: Near the sink, create a workstation with all the paraphernalia you need to wash, peel, and chop foods, including knives, butcher block, peelers, scrub brushes, bowls, etc. Food preparing: Here's where you would group scrapers, colanders, mixing bowls and spoons, whisks, measuring cups and spoons, blenders, and your food processor. Try to contain them all in one cabinet. Baking: Arrange all the things you'll need for baking in one cabinet. I put our collection of cake and ice cream sprinkles in a big plastic box. When it's time to frosh cupcakes for class, we all know right where to go. Nearby, in a second see-through container, we'll find baking soda, baking powder, and sugars, everything we need to make cupcakes. Snacking: Make kids more independent and let them fix their own breakfasts, lunches, and snacks by creating a snacking center in an accessible low cabinet (away - far away - from the stove). Sstation snack foods for the kids here: peanut butter, bread, jelly, raisins, cereal bars, chips, and zip-close bags. This is also a good spot for storing lunch boxes. Grouping these items makes it easy for kids to pack their own lunches. No pantry? No problem. If you don't have a built-in pantry, just assign some cabinets to the task. Then organize your foodstuff so you know what you have and where you have it. Group foods by type. Don't just stuff items into the first open place you see; instead, stock foodstuff in the same place each time, grouping like items. Repackage shelf hogs in glass or plastic air-tight containers. Put rarely used item on the tallest shelf. Put your family's favorite foods in the middle, at eye level. Heavy items such as cans go near the bottom. Use lazy Susans. Use lazy Susans, pullout shelving, and wire racks to maximize storage space. Repackage shelf hogs. Get rid of half-empty boxes of cereal and place the cereal in smaller, airtight containers. Label them with the contents and the expiration date. Unlike wine, food don't get better with age! Hey! You're not the only one chowing down in here. And yes, you can feed the pooch in the kitchen without letting the whole place go to the dogs. Stash the less-than-fragrant dog or cat food dish out of the way of (foot) traffic lanes. Try to store the food nearby. I keep our trio of bowls - two food dishes and one big water dish - underneath an inconspicuous corner table. The food is tucked into a nearby cabinet out of sight, but within reach when our two cats need chow. Under the sink, keep plastic tubs for recycling aluminum, glass and plastic. Let the kids do this. They'll love it. They'll even like taking it out to the garage. Really. Many a mom, including me, likes her kids to do their homework in the kitchen so she can answer kiddie questions while they work. If your kids study here, keep homework supplies close at hand, so the kids aren't continually jumping up and down (and prolonging the whole homework process) in search of erasers, compasses, protractors, dictionaries, etc. Empty a cabinet and create a little office supply center with notebook paper, construction paper, folders, pencils, pens, rulers, calculators, markers, crayons, and whatever else your kids use. Leave room to store ongoing projects, such as term papers and note cards.